Jack Russell Terrier exits a fox den. The Jack Russell Terrier is a small, principally white-bodied, smooth- or rough-coated terrier that has its origins in fox hunting. The name "Jack Russell" has been used over the years to describe a wide array of small white terriers, but now after a drawn-out legal battle, the JRTCA (Jack Russell Terrier Club of America) and its affiliates have won the exclusive rights to use the name Jack Russell Terrier to describe their particular variant of the dog, in the US. Commonly confused with the Parson Russell Terrier -- the AKC and affiliate variant -- and the Russell Terrier (a shorter legged, stockier variety), the working Jack Russell Terrier is a unique terrier which has been preserved in working ability as well as appearance much as it existed over 200 years ago. Jack Russells are sturdy and tough, measuring between 10" and 15" at the shoulder. The body length must be in proportion to the height, and the dog should present a compact, balanced image. Predominantly white in coloration (more than 51%) with black and/or tan markings, they exhibit a smooth, broken or rough coat. The skin can sometimes show a pattern of small black or brown spots -- referred to as "ticking" -- that do not carry through to the outer coat. All coat types should be dense double coats that are neither silky (in the case of smooth coats) nor woolly (in the case of rough coats). The head should be of moderate width at the ears, narrowing to the eyes, and slightly flat between the ears. There should be a defined but not overpronounced stop at the end of the muzzle where it meets the head, and a black nose. The jaw should be powerful and well boned with a scissor bite and straight teeth. The eyes are almond shaped and dark colored, and should be full of life and intelligence. Small V-shaped ears of moderate thickness are carried forward on the head. When the dog is alert, the tip of the V should not extend past the outer corner of the eyes. The tail is set high and in the past was docked to approximately five inches in order to provide a sufficient hand-hold for gripping the terrier. It is a serious fault for the dog to have its tail down when in the show ring. The Jack Russell should always appear balanced and alert. As the Jack Russell is primarily a working terrier, its most important physical characteristic is its chest size, which must not be so large that it prevents the dog from entering and working in burrows. The red fox is the traditional quarry of the Jack Russell Terrier (JRT), so the working Jack Russell must be small enough to pursue its quarry. Red foxes vary in size, but across the world they average about 14 pounds in weight and have an average chest size of 12-14 inches at the widest part. Jack Russells are first and foremost a working terrier. Originally bred to bolt fox from their dens during hunts, they are used on numerous ground-dwelling quarry such as groundhog, badger, and red and grey fox. The working JRT is required to locate quarry in the earth, and then either bolt it or hold it in place until they are dug to. To accomplish this, the dog must bark and work the quarry continuously. 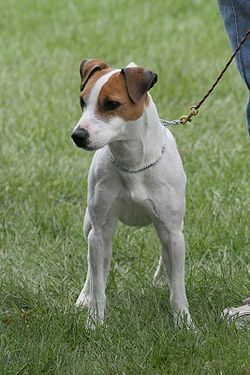 Because the preservation of this working ability is of highest importance to most registered JRTCA/JRTCGB breeders, Jack Russells tend to be extremely intelligent, athletic, fearless, and vocal dogs. It is not uncommon for these dogs to become moody or destructive if not properly stimulated and exercised, as they have a tendency to bore easily and will often create their own fun when left alone to entertain themselves. Their high energy and drive make these dogs ideally suited to a number of different dog sports such as flyball or agility. Obedience classes are also recommended to potential owners, as Jack Russells can be stubborn at times and aggressive towards other animals and humans if not properly socialized (a process that should be continued throughout their whole lives). Despite their small size, these dogs are not recommended for the condominium or apartment dweller unless the owner is ready to take on the daunting task of providing the dog with the necessary amount of exercise and stimulation. These are truly big dogs in small packages, a fact which can sometimes lead to trouble involving larger animals. The JRT owner must be aware of these tendencies and keep an eye out for trouble in many situations. The small white-fox working terriers we know today were first bred by the Reverend John Russell, a parson and hunting enthusiast born in 1795. In his last year of university at Oxford, he bought from the milkman a small white and tan terrier female called Trump. Trump was purchased based upon appearance alone. (Burns, 2005) She was the basis for a breeding program to develop a terrier with high stamina for the hunt as well as the courage and formation to chase out foxes that had gone to ground. An important attribute in this dog was a tempered aggressiveness that would provide the necessary drive to pursue and bolt the fox without resulting in physical harm to the quarry, effectively ending the chase, which was considered unsporting. This line of terriers developed by John Russell was well respected for these qualities and his dogs were often taken on by hunt enthusiasts. It is unlikely, however, that any dogs alive today are descended from Trump, as Russell was forced to sell all his dogs on more than one occasion because of financial difficulty, and had only four aged (and non-breeding) terriers left when he died in 1883. While Trump's appearance is without detail, and her size is a complete mystery, the fox dens of Devon, England, where John Russell once hunted, are well known. Terrierman Eddie Chapman, who has hunted those same Devon earths for more than 30 years, notes that "I can state categorically that if given the choice, ninety-nine percent of hunt terrier men would buy an under 12" worker, if it was available, over a 14" one." On April 29, 2007, a Jack Russell named George saved five children in a carnival at New Zealand from an attack by two pit bulls. He was reported to have charged at them and held them at bay long enough for the children to get away. He was killed by the pit bulls, and in 2009 was posthumously awarded the PDSA Gold Medal, the animal equivalent of the George Cross. A former US Marine also donated to George's owner a Purple Heart award he had received for service in Vietnam. In the UK, one of the more recogniZable canine stars was restaurateur and chef Rick Stein's irrepressible terrier Chalky, who frequently upstaged his owner on his various cookery series. He was unique in having his own line of merchandise, including plushes, tea towels, art prints, art paw prints and two real ales - Chalky's Bite and Chalky's Bark. He earned a BBC obituary when he died in 2007. Long believed to be Jack Russell Terriers, father Moose and son Enzo, played the role of Eddie, on the long-running TV sitcom Frasier. They are often mistakenly called Jack Russell Terriers because most of the public is unaware of the other variations of Russells. Eddie belonged to lead character Frasier's father Martin, and constantly "stole the show" with his deadpan antics. Eddie received more fan mail than any other Frasier character. Both Moose and Enzo were of Parson Russell Terrier genealogy, and many of their descendants are registered as Parson Russell Terriers with the American Kennel Club (AKC). Similarly, the role playing terrier on Wishbone, a television show which aired from 1995 to 2001 in the United States, who shared his name with the show, has had his breed wrongly identified over the years. Wishbone was also a Parson Russell Terrier from imported English and Scottish lines. The problem with having several different types of Russells is that it is difficult to determine the specific type until examining the individual dog's pedigree. Many Parson Russell Terriers and Russell Terriers have been referred to as Jack Russells over the years due to the fact that most of the general public and entertainment industry have been unaware of the existence of these other classifications. Actor Gene Hackman's pet in the 1995 movie Crimson Tide was a Smooth Coat Jack Russell Terrier.